Hawaiian Falls Waco covers an expansive 10 acres filled with exciting new rides and aquatic adventures. When it comes to fun in the sun, your Hawaiian Falls Waco waterpark is a can't-miss attraction, one that every member in your family is sure to enjoy. You'll want to come early and often to explore everything that our waterpark has to offer. Our Hawaiian-themed Waco waterpark boasts fun-filled rides for kids and adults of all ages, from the littlest Keikis to the Big Kahunas in your family. Soak up the fun at Breaker Bay where you can body surf, swim, or float on the waves in the first large-scale wave pool in Central Texas. Scale the six-story Tempest Tower and take your pick of thrilling covered tube slides and freefall body slides to race to the bottom. Relax on the 800-foot-long Kona Kooler lazy river or watch the little ones giggle with delight as they explore the shaded Waikiki Waterworks spray ground. Like all of our Hawaiian Falls waterparks in Texas, our Waco waterpark is designed to offer your family a convenient, comfortable, and enjoyable way to spend quality time with your family. Our family-friendly extras begin with your choice of VIP or free parking. Satisfy hungry appetites at Sharkey's Restaurant or a quick snack from the Surf Shop. Our Texas waterparks also offer locker rentals and feature surf shops where you can pick up items like sunscreen and extra towels. Visit our surf shop for everything you need including: lockers, candy, ice cream, snacks, drinks, water toys, water shoes, cotton candy, sunscreen, sunglasses and various Hawaiian Falls souvenirs. Menu and surf Shop items at Hawaiian Falls Waco are subject to availability and may change at any time. Spending the whole day by the wave pool? Bring some snacks! We kindly request no cooked, prepared, or catered food enters the park. Pizza delivery, fast food, and homemade large dinners are prohibited. Hawaiian Falls does not allow alcohol, glass or sharp knives. Any size cooler and/or bag containing food or drinks will be charged a $15 fee and will be searched upon entry. You can't visit Hawaii without grabbing a cool shave ice. Often described as "eating a cloud", your favorite flavor will taste like a dream! Some popular flavors are cherry, strawberry, blue raspberry, coconut and lime. Flavors may vary by locations, availability and may change at any time. Inflated tubes are free at Hawaiian Falls and available for use at each specific attraction. Tubes cannot be removed or taken to other areas or attractions in the park. 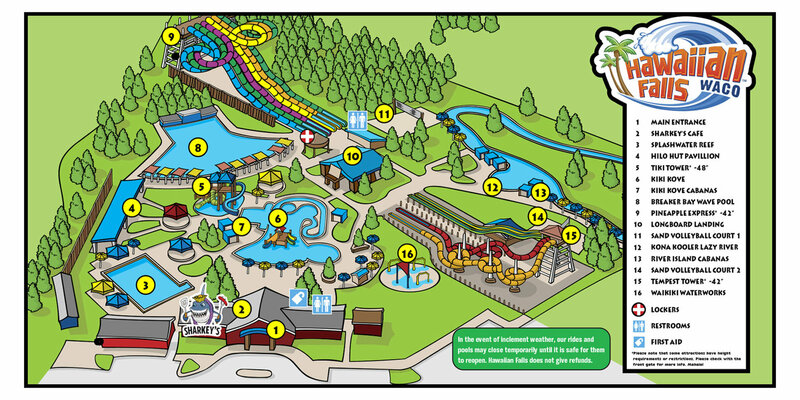 Hawaiian Falls Waco is located 4 miles west of Interstate 35 on Lake Shore Drive, across from Riverbend Ballpark. 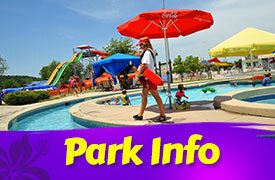 Parking is always free at Hawaiian Falls Waco. VIP Parking may also be available for a nominal fee. Hawaiian Falls Waco always has free floating tubes and life jackets. Coolers are allowed but there is a fee. 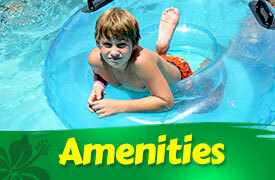 View official hotel and motel partners of Hawaiian Falls Waco. At Hawaiian Falls, our five waterparks in Texas are built with your family's fun and safety in mind. Each member of our Hawaiian Falls team strives to ensure that you come away from our Texas waterparks with lasting memories that you'll treasure forever. With more than 40 years of experience, we're dedicated to providing you with waterpark attractions and activities that your entire family can enjoy. 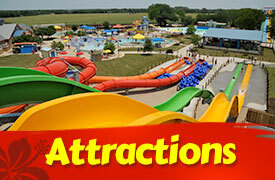 South of DFW, Hawaiian Falls Waco waterpark caters to central Texans throughout Hillsboro, Temple, Killeen, and more. Hawaiian Falls Waco Waterpark is also just minutes from the popular Magnolia Market at The Silos in Waco, Texas! Hawaiian Falls Waco, with its recent updates and upgrades, is your North Central Texas waterpark destination this summer. Come for the slides, the rides, and all the family-fun in the sun. No matter if you’re driving through or live close by, Hawaiian Falls Waco is your Hillsboro waterpark haven this summer. If you’re looking for a Corsicana waterpark, check out Hawaiian Falls Waco for endless water adventure all summer long. 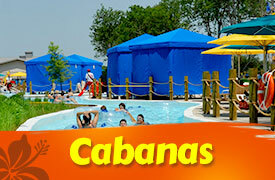 Come out to Hawaiian Falls Waco, your Temple waterpark, for all your summertime water attractions. Your Killeen waterpark located at Hawaiian Falls Waco is just up Interstate 35, and is the summer fun destination for water rides and slides that is sure to please your whole family. Beat the Texas summer heat at Hawaiian Falls, the College Station waterpark located just to the south in Waco.